Identification: Quite variable. Males usually have black antennal knobs. Upperside is orange with black borders; postmedian and submarginal areas are crossed by fine black marks. 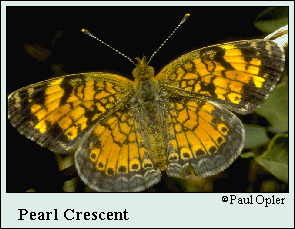 Underside of hindwing has a dark marginal patch containing a light-colored crescent. Spring and fall broods (form marcia) have a gray mottled hindwing below. Life history: Males patrol open areas for females. Eggs are laid in small batches on underside of host plant leaves. Caterpillars eat leaves and are gregarious when young. Hibernation is by third-stage caterpillars. Flight: Several broods; from April-November in the north, throughout the year in the Deep South and Mexico. Caterpillar hosts: Several species of smooth-leaved true asters including Aster pilosus, A. texanus, and A. laevis. Adult food: Nectar from a great variety of flowers including dogbane, swamp milkweed, shepherd's needle, asters, and winter cress. Habitat: Open areas such as pastures, road edges, vacant lots, fields, open pine woods. Range: Southeastern Alberta south through Montana, Wyoming, Colorado, New Mexico, Arizona, and southeastern California to Mexico; east to southern Ontario and all the eastern United States. Butterflies in the Boston-New York-Washington Region. Oxford Univ. Press, New York, N.Y.  160 pp.